The Cube Cities API now provides access to Markers & Meters. 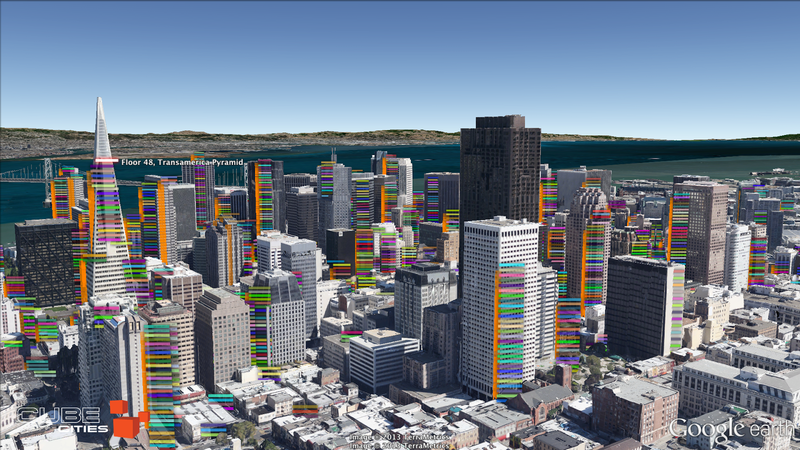 These new controls provide floor-level information to every building in all of our cities. Each floor marker (seen multicoloured in image above) and energy meter (indicated in orange) is colourized to indicate any user-selected building variable. Perfect for visualizing energy or water consumption on a floor level. But the best thing about Markers & Meters is they are designed to work with Google's new 3D imagery, making them perfect for Google Earth on iPad or Android. Here's a video showing off how buildings downtown San Francisco come alive and accessible with Markers & Meters. To learn more about the Cube Cities API and how to get access to Markers & Meters, sign up with us and we'll send you the details.